Washing machines. Specifically in my case the ZWD81663NW by Zanussi. If you are a fellow owner. You will know that everything associated with it has to be followed by a painfully shrill response from a piezo buzzer. The din is annoying enough during the day, but anyone making use of economy seven has to have the delight of it announcing itself at the top of its lungs in the small hours of the morning. It’s shrill, deftly cries calling out in the middle of the night, with all the decorum of a rabid blood hound incensed by the light of the full moon. I am sure that someone will likely point out that if I had bothered to look in the manual,I would have found it in black and white. I am however in IT. We do not do that. I was moments away from attacking it with a screw driver, but decided to randomly splurge buttons to see if there was a ‘secret’ combination to get it to do what I wanted. 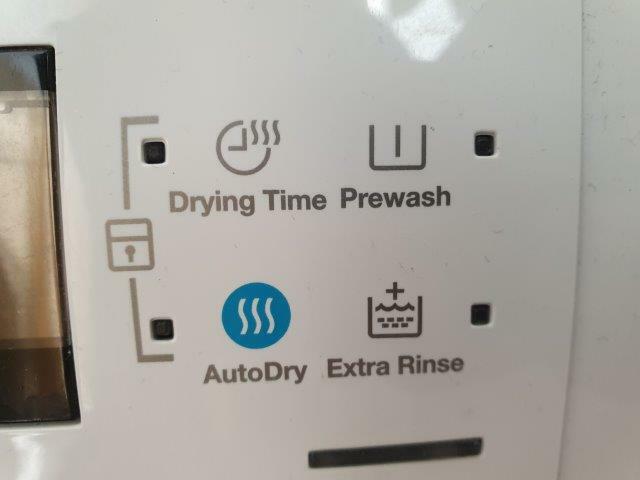 Simultaneously hold down the ‘AutoDry‘ and ‘Extra Rinse‘ buttons for 3 seconds. The machine will make a semi-depressed low pitch beep and fall silent. The piezo buzzer is now disabled. This disables both the programme completion alarm and the auditory responses to the pressing of buttons. If you wish to re-enable the buzzer, simply repeat the process. A simple job, right? My friend was complaining that their Toshiba Kira-102 kept crashing. The diagnosis was a speedy affair. The ‘as shipped’ 250GB Toshiba SSD had only 200MB remaining on the OS partition and Windows just was not coping with this reality. Windows Update was trying to churn through this free space in an endless cycle of “try and fail”. The Kira-102 has an older-style mSATA connector. Fortunately, as of February, Samsung had the foresight to continue to support mSATA with the release of the new 860 EVO range. This offers 250 GB , 500 GB and 1000 Gb (1 TB) options in the legacy mSATA format. My friend wanted to go all out on it, so it should have been simple. If you have arrived here seeking a quick answer to whether or not the 500GB or 1TB mSATA 860 EVO is compatible with the Toshiba KIRA. The answer is yes! Please consider using my Amazon links above if you are looking to buy! The method to do this should be tried and tested to any “IT guy” (or Gal). If you are struggling with any of the same issues. Find a list of issues and (non)resolutions for this machine below. Fix: In Windows Setting, Updates and Recovery, Recovery. Boot into Windows Recovery and follow through on the advanced options until you come across the boot into the UEFI setup option. Once in the UEFI. Disable Intel Fast Boot. The system will now respond to the F2/F12 keyboard shortcuts again. Fix: I know that these dongle have OpROM on them. I therefore believe that the Kira-102 doesn’t have UEFI drivers for PXE boot. Fix: In the UEFI enable Legacy USB device support to fix this in everything apart from Windows Setup (where it still would not work). 4. After re-imaging from CloneZilla the 1000GB 860 EVO reported to Windows that it was a 238 GB drive. Samsung Magician showed the SSD drive as functioning correctly, compatible with the system and running as a 1000GB drive with no problems. The firmware was also current. The UEFI did not seem to have any issues seeing the drive – although it has no capacity readout of its size or UEFI shell to root around in. Equally, there was no additional instability. As a 2015 machine, it certainly shouldn’t be experiencing a software limitation – such as in the aviailable LBA (Logical Block Address) space. Something that historically has limited BIOS system from addressing hard drive space such as with the historic 2GB, 32GB, 146GB and 2TB limits. Toshiba Service Station reported that there were no updates available for the machine. The BIOS version was 1.40, which reported as current. However, on accidental inspection of the Toshiba support site, I discovered that there was a 2018 revision 1.60 available. The changelog for the release indicates that the 1.50 version contained “improved SSD related system stability” with the 1.60 adding “Enhanced security & Microcode update” i.e. they patched the high profile IMEI exploit from last year and did something to mitigate Spectre/Meltdown. I patched the BIOS, ever hopeful… to find that nothing had changed in Windows. Exiting CloneZilla into the shell, allowed me to elevate into the user account and run parted -l. Parted reported partition errors, however after fixing them, running ‘print free‘ didn’t show any free space either. At this point assuming that there was an artificial hardware limit placed on the storage sub-system, I booted into a Windows 10 install UFD and using diskpart via the command prompt de-initialised the entire disk. Low and behold, the entire 930GB volume appeared in diskpart ‘list part‘. I clean installed Windows 10 onto the empty drive to confirm this. There was clearly a software corruption at work. This could be from the amount of crashing that the machine had endured over months of constant crashing. Alternatively, it could very likely be down to Toshiba’s partition schema and OEM imaging process. Leaving the test install alone I booted back into CloneZilla. Due the way CloneZilla works, you cannot restore a partition into free space, only overwrite an existing partition. Instead of recovering the disk from image, I used recover partition from image. The intention is to leave the new Windows installation’s boot code, but overwrite its OS data volume with the one from the CloneZilla image. There were 6 partitions in the repository, none of which had any size data against them. Windows had the main OS partition as the third partition on the drive, however this turned out to be a 138 MB partition of unknown origin (I suspect something hidden in the Toshiba OEM imaging process). Retrying, the large data partition was found in the image at partition 4. 50 minutes later, the partition had restored back onto the 860 EVO. It still showed as being 930 GB in diskpart, but would not boot. Windows blue screened with error code 0xc0000034. There was of course no expectation that the system would boot after this process. The system no longer had the correct boot code in place as the OEM install had additional partitions in-situ. Now mount the FAT32 EFI boot partition and repair the boot code. Note the volume number of the 100MB System partition. In my case this was “Volume 2”. If your EFI partition is something other than 2, replace the 2 on the next line with that number. After going through an ordeal such as this, the question of whether or not it is stable springs to mind. The Windows 10 version was 1803, so after running a chkdsk c: /f and ensuring that the OS volume was now using the entire 930 GB. I upgraded Windows 10 to version 1809. Something that gives the SSD some exercise and would highlight any serious problems. The Windows 1809 upgrade went through without incident and I was able to write more than 250 GB of data onto the volume, proving that the SSD could correctly function over the 250 GB marker. If you have been following the saga of the non-working Hyper-V Server 2019 release from November. You may be aware that the most prominent issue – that of Remote Desktop Services for Administration not working – has now been resolved in the February 2019 patch release cycle. This article outlines how to create updated media for Hyper-V Server 2019 using the original installation medium and patch it into a working state. Please note that if you intend to use Hyper-V Server in a production environment, you should wait for Microsoft to re-issue the office ISO. Once it is released, it will be made available in the Microsoft Server Evaluation Centre. You will need access to a Windows 10, Windows Server 2016 or Windows Server 2019 system in order to update the installer. Note: This is correct as of early March 2019. It is suggested that you apply newer cumulative and servicing updates as they are released in the future. cd /d "C:\Program Files (x86)\Windows Kits\10\Assessment and Deployment Kit\Deployment Tools\amd64"
dism.exe /mount-image /ImageFile:"C:\hvs\Sources\install.wim" /Index:1 /MountDir:"C:\Mount"
Note: Do not navigate into this folder with CMD, PowerShell or Windows Explorer. If you leave a handle open against this folder when you try to re-pack the install.wim, it will fail. dism.exe /Image:"C:\Mount" /ScratchDir:"C:\Windows\Temp" /Add-Package /PackagePath:"C:\hvs\lp.cab"
At this point you will have a working installation image which you can use to create a new ISO, UFD or install via WDS. You should delete the Updates folder and [optional] lp.cab from C:\hvs before creating a new ISO or bootable UFD. Delete the C:\Mount and C:\hvs folders once you have finished creating you new deployment media. If you follow the above, you will have not only a fixed RDP experience, but also a current patched version of Hyper-V Server. Eliminating a little time spent waiting for Windows Update to run. If you are going to enable RDP for Administration. As ever, do not forget to enable the firewall rule in PowerShell. SConfig.cmd does not do this for you!